There are so many different people and silk painting can offer something for all of them. If your intention is only to be able to make a nice present every now and then for your beloved ones or for yourself, celebrating the joy and the beauty of life – you can create mandalas, pictures, scarves or kerchiefs on silk. If you are longing for tranquility, relaxation and delight that can be experienced during painting – you will see how to re-charge and relax while you paint. Thoughts will calm down, your full attention will be absorbed by the play of colours on the silk – it is meditation, a meditative state of mind that wraps you during painting. 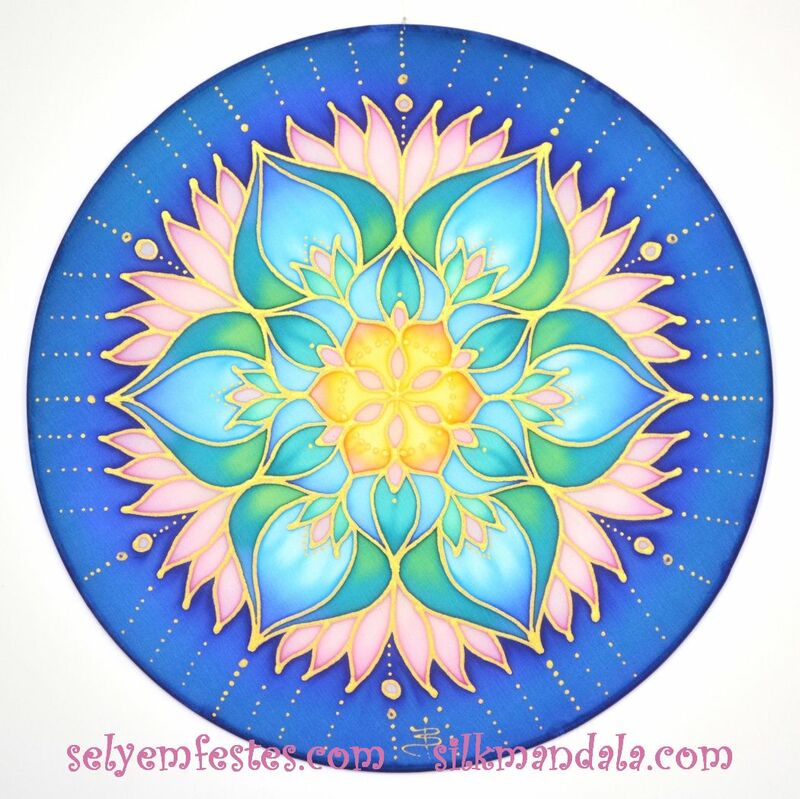 Silk mandala painting is a spiritual mandala art. If you want to experience your creativity, either in painting or other areas of your life – your right and left hemispheres can be harmonized with the help of the painting, your creative flow begins to improve. It will have an effect on your everyday life and on your spiritual and physical state while you can experience the pleasure of silk painting. If you are looking for the answers to your inner questions – you may find them with the help of painting. The painted silk reflects your state of mind – if you look into this mirror you may find your way and gain self-esteem or courage. There are many of us who are looking for the answers in many places: how could we live our lives in happiness and accomplishment? How can we find ourselves among our challenges? How can we find solutions to our continuously arising problems? Which way should we choose to be able to experience Who We Really Are? What kind of activities help us reach our aims? So many people, so many answers. However, there are some similarities, main roads beside the individual paths: some of us sing, some of us dance, for others it is some kind of sport activity that gives them the joy of living. Something that gives us power, re-charges us and establishes connection with the base of our existence. Painting can also be a way for anyone who likes colours, forms, likes creating something with their own hands, has inner pictures or simply enjoys the pleasure of creation. In summary, silk painting is a relaxing and calming technique that drives into a kind of meditation while creating your own personal silk mandala painting.